Port wine (also called Porto or Vinho do Porto in Portugal) is a delicious, sweet, fortified wine produced in the Douro Valley of Northern Portugal. The combination of the multiple varietals of grapes that are blended and the conditions of the region they are grown in produces a distinctive taste that is hard for vineyards in other parts of the world to replicate. Port is created by adding brandy late in the fermentation process. The brandy is added in order to boost the alcohol content and halt the fermentation process, allowing the drink to maintain its sweetness. Port is usually served as a dessert wine at the end of the meal or as an Apéritif. 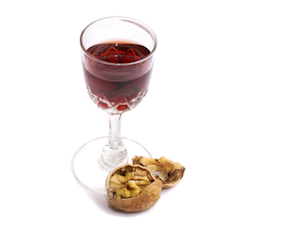 It is commonly paired with cheese, nuts or chocolate. Port is enjoyed by people all over the world, including myself. I was introduced to Port by my husband (who is Portuguese). Ever since, my appreciation has continued to grow for the various rich, smooth, sweet tastes the different styles of this wine offer. But is it healthy? What are the health benefits of Port? Like other red wines, Port contains beneficial vitamins, minerals, nutrients and antioxidants (like flavonoids and a substance called resveratrol). Recent research has shown that drinking red wine can protect against prostate cancer, Alzheimer’s disease (staving off mental decline) and heart disease. The most current research has been focused on the polyphenol, resveratrol, which is present in the skin of the red grapes used in the making of red wine. Resveratrol seems to be a key contributor to promoting hearth health, by reducing bad cholesterol, preventing clots and protecting against artery damage. Is Port healthier than other red wines? If you are looking for an optimal wine drink that is bursting with beneficial nutrients, then port wine may not be your best pick. Port has both higher alcohol and sugar content than most red wines, making it a less healthy choice. Even though Port may not be the optimal drink when it comes to health, it does contain some health benefits when consumed in moderation. So, for those of us who enjoy a glass of Port every now and then to complete a special evening, you can continue to raise your glass to good health! Because, after all, drinking port in moderation can be good for your health! Its good to know that my nightly glass of red not only tastes good but is also good for my health! My grandfather lived to a good age and maybe it was because he always had a glass of red wine with lunch and dinner. Absolutely love a glass of Port on a cold night but I wonder if the liquer muscat’s have the same properties. Similar in strength. There are a variety of grapes that are called muscat and some are white and some are red varietals. However, it appears that there may be some good antioxidant properties in Muscat as long as it is produced in the same manner as Red Wine, which means fermented with the skins. Unfortunately, I don’t know if that is how the majority of Muscats are made. Try drinking American Port not Oporto but “Port”..we are in the Napa Valley and specialize in Port Production only! Prager Ports are one-of-a-kind..support your local producer making Ports for over 30 years. I would love to try it, but I have never seen it anywhere before. FYI: Labelling and marketing that wine as Port is illegal and a scam as Port is a PDO (protected denomination of origin) item like Champagne. It was actually the first PDO to be created anywhere in the world before even Bordeaux. Taylor Port is made in upstate NY, sold nationally – their tawny is delicious and reasonably priced. I love a glass of port in the evening. I am fairly new to drinking port, after suffering from a very bad dose of food poisoning port is the only wine I enjoy. I have noticed that when I have a pain in the back of my head, 5 tablespoons of Fonseca Porto Bin #27 relieve this pain within 30 min. It works better than any prescribed medication. I always keep this port wine at home as a medicine. Other red wines do not help me. They cause muscle pain and very dry mouth. how much volume to be taken on daily basis.. I love to mix Taylor port with red miscato. I feel that this is a perfect combination for a great red wine. I drink one glass before bed each night and I sleep like a baby.